Ever notice how small flourishes and subtle transitions dramatically increases the value of the experience you enjoy with an app or site? Designing and developing UIs for the mobile web is tricky, but it's extremely difficult to do that while delivering something that performs at 60fps. The best opportunities to getting jank-free transitions on phones/tablets are CSS transition and keyframe animation based, especially tapping into hardware-accelerated transforms and opacity changes. @daneden did really nice work with Animate.css but I think the web would benefit if we could take that work to the next level. There's already been fantastic experiments and demos exploring CSS-based transitions, but it's distributed all over. Provide a minimal UI. 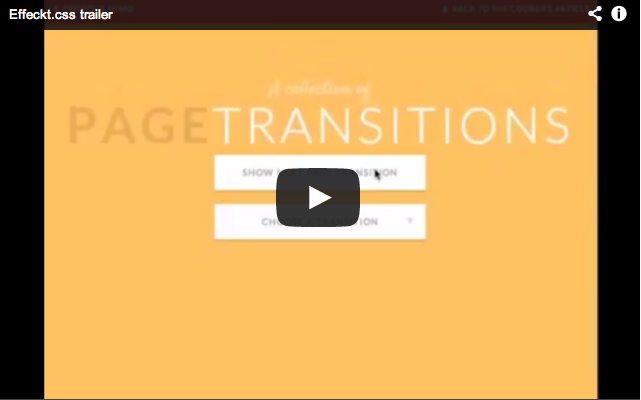 Only use style hooks for transitions and animations. If a particular effect cannot deliver target performance (hey blur() css filter), it cannot be included. Deliver a builder so users can pull only the CSS they need. There is no hover on the mobile web, so any hover-based effects would be excluded or have a tap-based equivalent. If you know other transition/animation based demos/experiments that make sense to include here, file a ticket. If you're interested in helping to define the API, let's hear it! File a ticket. A web-based builder is a must. A command-line builder isn't important for this.